If you haven’t been paying attention, like me, you may have missed all the fun that’s been going on in the movie blogging world over the last week or so. It all started with Andy over at Fandango Groovers, who thought it might be an idea to play Desert Island Discs with DVDs. For those of you not from the UK, the game works like this: if you were stranded on an island for an indeterminate length of time, what 8 films would you take with you to keep you sane while you waited for the rescue boat? You might have noticed that making decisions is not my strong point. Trying to list my favourite films is an impossible task as far as I’m concerned, so I’m taking a slightly different tack here. Yes, all the films I pick will be firm favourites, but, fickle as I am, I reckon if I was stuck on an island I’d need variety to keep me going. My first choice isn’t going to shock anybody. I am, of course, going to pick a Lord of the Rings film. However, cruel fate means I can only pick one, and that’s a harder decision to make. I get asked a lot which is my favourite of the trilogy and I honestly don’t have an answer. I have a particularly soft spot for Fellowship because when I first saw it I had no idea what Middle Earth was or how I would react to the film. In this case though, I’m going to pick Return of the King, for two reasons. First of all, value for money! It’s the longest (and if I take the extended addition, it’s over 4 hours) so it would keep me more than occupied while I sat on my beach; and secondly, it’s got everything in there. Almighty battle scenes, heartbreak and laughter. And of course, I’m never going to get tired of watching it over and over. Onto number 2. I’m going to need a guns-blazing action flick while I’m stranded and when it comes to action there’s only ever one real choice. Die Hard. Bruce Willis, British actors playing German terrorists, Enough C4 explosive to blow a hole in the world, what more could you ask for? Round 3. This one has proved a popular choice, which I’m picking for much the same reasons as Ross McD. This is a movie I can (and have) start watching again straight away as soon as it’s done. It’s full of energy, colour, great music, humour and heart. It’s a story about Truth, Freedom, Beauty and above all things Love. It’s Moulin Rouge. Halfway through now, time for pick number 4. At some point during my time in isolation I’m going to get a craving for some Disney magic. It was a tough battle between this next film and Toy Story, but in the end I had to go for The Lion King. The score alone is enough to make me want to take it with me and it’s probably the last truly great Disney film before Pixar came along. It’s getting a bit harder now. I’m trying not to over think my choices and just go on instinct. So pick number 5. Well, I couldn’t have a list that didn’t have some Johnny Depp in now could I? I’ve got to take Pirates of the Caribbean with me (the original and the best) if only to remind me that being stranded on a desert island might not be the end of the world. Unless the Rum is gone. Number 7 I think is going to have to be Billy Elliot. It’s my go to film when I’m feeling down. Full of great British actors and even better British music, it’s a beautiful story that reminds you that even when things look hopeless they can still turn out OK. Think that might come in handy. I think what this list is missing is a comic book movie, and if I’ve got to pick my favourite, I think it will have to be X2. Close run thing with Wolverine, but I think the former just has the edge. And that’s it. I think with those 8 to keep me company I’d be quite happy on my island for a while. You are on the list. I did send you an invite over a month ago! 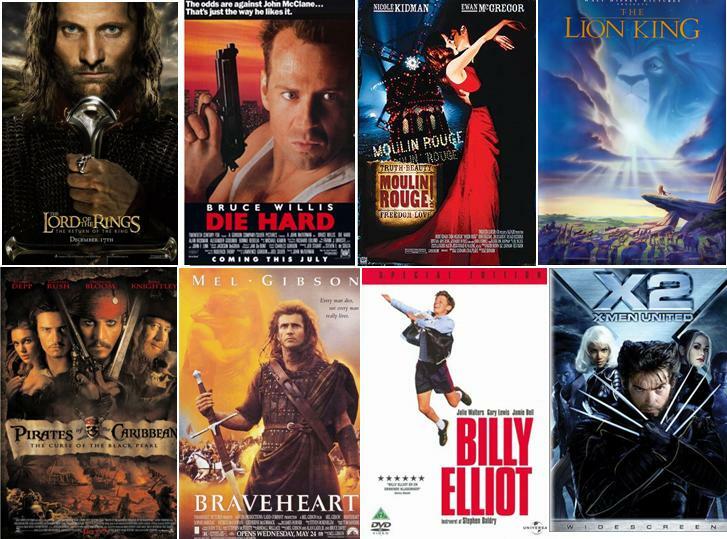 Interesting list, you managed to pick the weakest of the LOTR movies but I could never get tired of watching Die Hard. Awww Katie wasn’t picked for the team! Sweet list, though I can’t believe you nearly picked Wolverine over X2. but i thought you knew something about films, Katie? Die Hard never gets old. It’s like that Friends joke. watch it again and it’s Die Hard 2! McG:you always make me laugh. Unfortunately you’re nemesis and I share some kind of kindred spirit when it comes to films. Damn, I meant your not you’re. Shocking. “Braveheart,” you say? Excellent choice. It’s historical accuracy is nonexistent, but it’s my favorite Mel Gibson movie still. I admit I didn’t see an “X-Men” film coming. 25 points for the element of surprise! Great choices. Love that you have included Billy Elliot and I can’t believe I forgot it from my list, haha. Better late than never Katie…welcome to the dance! Some solid choices here, and a little bit of everything (music, comic books, action, adventure, and drama)…even if you did choose my least favorite of the Rings trilogy. By the by, Fletch and I had a pretty decent conversation about this little exercise in the most recent episode of my podcast. Give it a listen if you’re interested, yes? Meredith, have you never seen Mad Max or Lethal Weapon. Meredith: I’ll take those 25 points thanks! Sorry you didn’t get the message, I emailed you. Must have got the address wrong. Still we got there in the end. As for the LOTR debate. Nothing majorly wrong with Return of the King, the only real issue is that it just goes on and on for ever after the story is resolved. Good call on Billy Elliot. That would bring a much-need smile to my face while I’m dying of hunger on a desert island. Andy: Yes but if you’ve read the book, it goes on for even longer after the resolution. PJ took out an entire war to speed things up! Aiden: That’s what I was thinking. Plus it’s just a great film. And if I got bored I could teach myself to dance. I love your list…I know how difficult it is to choose 1 of The Lord of The Rings series, I have think hard for it…in the end I chose the 3rd one because it was the longest of all. I’ve watched Die hard more than 3 times … it was almost made it to my list too. I chose Die Hard for my list too 🙂 I forgot about Johnny Depp though – Can I swim to your island and borrow POTC? Even a ‘weak’ LOTR film is still years better than normal ‘good’ film, so no bad pick there, Katie! Love Die Hard, too, and for Hans Grubber of course, though Jeremy Irons as his brother ain’t too bad, either. I’d pick the 3rd one ‘cuz I love Sam Jackson/Bruce Willis combo. Moulin Rouge almost made it to my list, but it is definitely re-watchable. Billy Elliot is the reason I adore Jamie Bell, he’s hugely underrated. I keep wishing he stars in more movies than say, Channing Tatum, ugh! I love the 3rd one too but I think the original is the best. Jamie Bell is amazing to have carried a film like that when he was so young. You don’t want to miss stuff now do you? Mamma Mia: Officially the worst film I've ever seen. "He's just as brilliant as you are. And infinitely more devious."